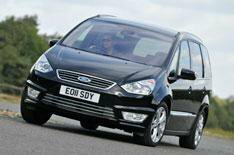 Ford Galaxy 1.6 Ecoboost SCTi 160 | What Car? What is it? An unusual thing: a big MPV with a petrol engine. With the imminent demise of the 2.0-litre non-turbo petrol, this 1.6 turbo model will be the cheapest Galaxy, undercutting the entry-level 2.0-litre diesel by 1050. With plenty of low-rev punch and decent fuel consumption, it sounds promising on paper. Whats it like to drive? Good, if not as good as a diesel. Yes, it pulls well from below 2000rpm, but you have to press the accelerator harder and for longer to speed up than you would in a diesel. Its perfectly acceptable in most situations, but its something to bear in mind if your Galaxy will regularly be loaded with people and luggage. The rest is standard Galaxy, which means a beautifully controlled ride and impressively tidy handling for something so big. Theres little engine noise at any revs, and you wont be bothered by excessive noise on the motorway. Visibility is good, but while everyone will appreciate the accurate, informative steering, some people may wish it was lighter around town and at parking speeds. Whats it like inside? You need space in a MPV, and thats exactly what you get in the Galaxy. Theres loads of room in the front and middle-row seats, and even the two rear ones are fine for adults if those in front slide theirs forwards slightly. Dont need all seven seats? Its simple to fold down the rear two, which gives you a huge boot. Drop the middle row and theres enough space for your children to play five-a-side. Add a comfortable driving position, clear dashboard layout, plus lots of standard equipment, and youve got a pleasant place to spend time. Downsides are few. The optional touch-screen audio and sat-nav system is a little fiddly, and although the materials in the drivers direct line of sight are suitably plush, those lower down and towards the back of the cabin feel distinctly lower quality. The air vents in the rear seats certainly dont feel like theyll survive much child attention. Should I buy one? If your Galaxy will be used to ferry the kids to school and little else, then yes, the 1.6 Ecoboost is well worth considering. Its the cheapest to buy and the engine is fine for town driving. Average fuel consumption of 39.2mpg isnt too bad, either. If your Galaxy will be transporting more people and doing plenty of miles, youre better off with the 2.0 TDCi 140 diesel. Its effortless to drive and will do an extra 10mpg. Yes, itll cost you more to buy and is slightly more expensive as a company car, but its worth it.